So begins another 30 day blogging challenge to which I am committing at the last minute of the first day to do so. Here’s hoping something close to 30 posts actually happen. This year’s topic: Faith. I have touched on it here and there the last three years writing for Rural Route 2 and recently have contemplated exploring my personal faith journey in a more public fashion. My mother is Catholic and we kids developed our faith and religious tendencies within our local Catholic church, but we also attended the church of my dad’s childhood, the First Congregational Church of Lee Center. The differences in the church families and the religions were stark at times, but I believe shaped the way I view faith versus religion. Farmers are usually a pretty faithful people. We have to be. Although we control so much of the how of farming, there is still more dependent upon Mother Nature and the luck of the draw. Conversations about faith mirror today’s conversations about farms and food. Both topics can be incredibly personal and are likely to spark intense discussion. I have no intention of sparking intense discussion with this series. Rather, I offer a personal reflection to which you may or may not relate. I can’t quote the Bible and am a couch Catholic. Don’t ask me any deep questions about church doctrine. I probably won’t know the answer. During this month, I’ll share some old posts, favorite quotes, maybe a few pictures and trace my faith journey from attending (and dreading) catechism classes to teaching vacation bible school; from the moment I choose to accept God as the Alpha and Omega to the depths of despair that led me to believe in the power of prayer. 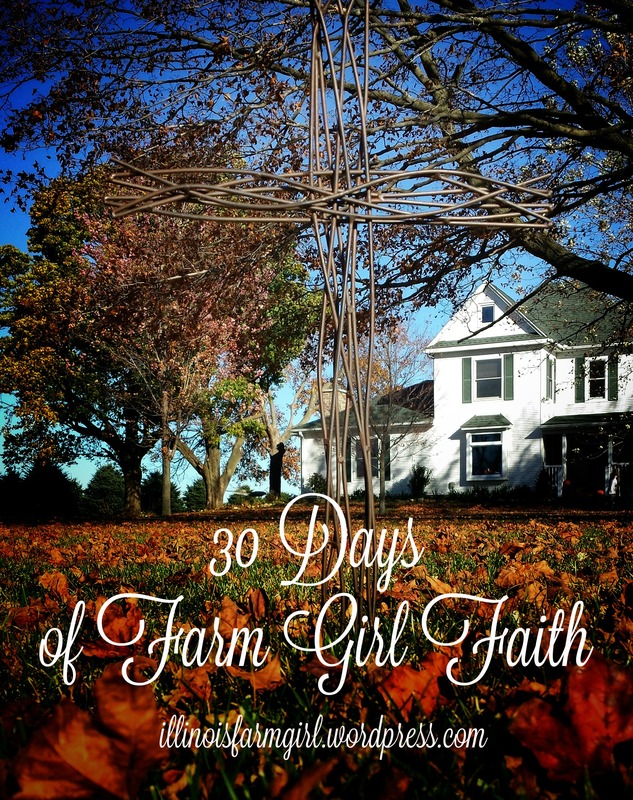 So, I offer 30 Days of Farm Girl Faith – a reflection on the short time God has given me in this life and what I have come to know and what I need to still learn. This entry was posted in 30 Days 2015, Faith and tagged 30 Days blogging challenge, faith, farm girl, farmers, farming, religion. Bookmark the permalink. Pingback: MN Agriculture: Marie Dranttel - "Watermelon Diva"
Pingback: MN Agriculture: Sarah and Dan Brouwer, "The Strawberry Express"
Pingback: MN Agriculture: Ashley Schmelling - A True "Woman in Ag"
Pingback: MN Agriculture: Darin and Kylene Lehmann, Dairy Farmers and "Testers"